Domaine Berthet-Bondet, Jura, France. July 2016. 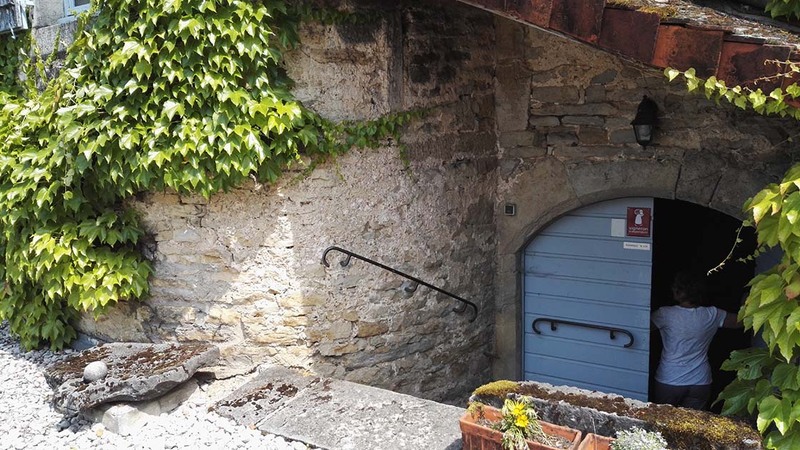 Domaine Berthet-Bondet – historic part of the house and vaulted cellars. Jura, France. July 2016. From Château d’Arlay, we continue our tour of the French Jura to another one of our all-time favourites: Domaine Berthet-Bondet, owned and managed by Jean Berthet-Bondet and his wife Chantal, both agronomists who studied (and met) at the college in Montpellier. Both have – like so many people in France – the odd ancestor who was involved in viticulture, but for all intents and purposes they are first-generation winemakers, who bought the domaine – including a vaulted cellar and a house with a part dating back to the 16th century – in 1984. A year later, Jean and Chantal harvested their first crop, and this event was celebrated 30 years later, in 2015, with a special edition of their Tradition white wine, the Cuvée du Trentenaire, in which they have assembled all vintages of their Chardonnay and Savagnin blend from 1985 up to 2012. In the meantime they are also in conversion to organic viticulture, under the AB (Agriculture Biologique) label, and their daughter Hélène has joined them at the winery. Village and vineyards of Château-Chalon. Jura, France, July 2016. 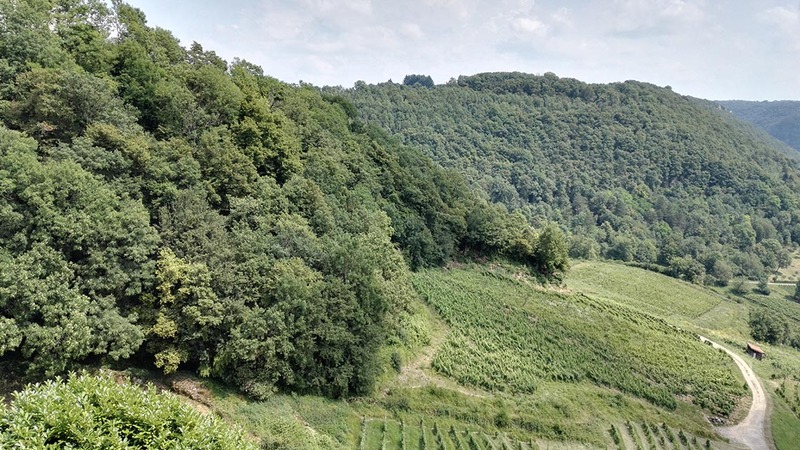 Domaine Berthet-Bondet is located in the picturesque village of Château-Chalon, where they cultivate about 15 hectares of vineyard, half of which fall under the AOC Côtes du Jura, and the other half under the vin-jaune-only denomination AOC Château-Chalon. 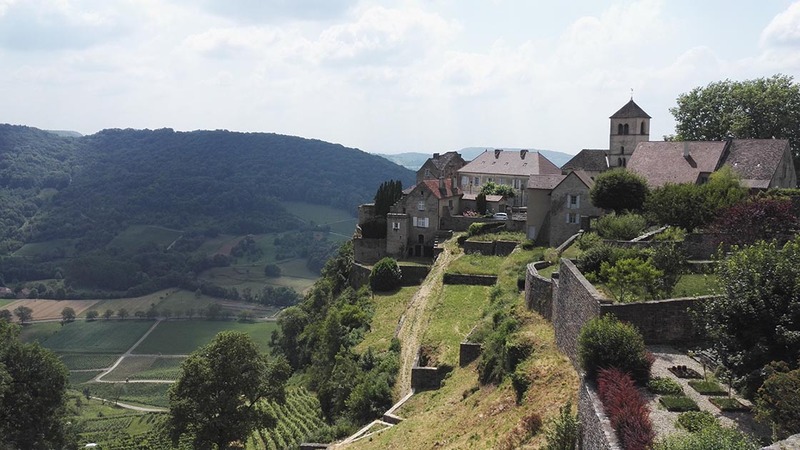 It is truly a beautiful part of the world: a charming, sleepy village on a cliff in the Jura mountains, overlooking scenic vineyards stretched out over rolling green hillsides, happily basking in the summer sun and in its title of one of The Most Beautiful Villages of France. The rolling green vineyard landscape of Château-Chalon. Jura, France, July 2016. Historic records show that this region was already famous for winemaking 2000 years ago, and Jura wines were popular at European courts all through the Middle Ages. But a series of wars, vine diseases and economic shifts in the last few centuries decimated local viticulture. Fortunately, throughout the 20th century, there have been many initiatives to restore Jura wines to their former glory, including the establishment of the AOCs Arbois, Château-Chalon, Côtes du Jura and l’Etoile in 1936/37. Still, from the 20,000 hectares of Jura vineyards at the end of the 19th century, only 2,000 hectares are currently under cultivation. The way the Jura has conquered its challenges shows that the passion, determination and pursuit of quality is there, resulting in unique and unforgettable wines from many top-notch producers, and Domaine Berthet-Bondet has definitely earned its place among them. Just stop by for a visit, and the landscape as well as the wines will convince you in no time! 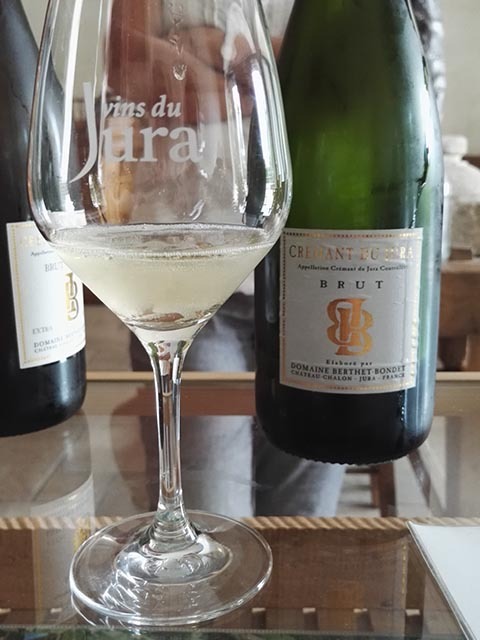 Crémant du Jura Brut N/V. AOC Crémant du Jura, Jura, France. We love Crémant du Jura here at Wine & words, and we love Berthet-Bondet, because their entire range is of good quality, and well priced. Their crémants will give many an entry-level champagne a run for its money. Like this organic conversion Brut: a fine, elegant and highly refreshing expression of Chardonnay, showing crisp apple and citrus over gentle layers of breadcrumb and nuts, and just enough dosage to showcase the fruit. A lovely aperitif or pairing for fresh seafood. Crémant du Jura Brut Zéro N/V. Simply a fantastic Crémant – bone dry (zero dosage), pure and refined, an elegant expression of Chardonnay, with lime & grapefruit, apple, mineral impressions and buttered brioche. In price we’re getting closer to entry-level champagnes (13€ cellar door), but you’ll be hard-pressed to find one of similar quality and finesse in that price range. A fine mousse, good acidity and a citrus-bitter finish add extra freshness. Perfect as a classy aperitif, with seafood or sushi, or as a trickster in blind tastings. Crémant du Jura Rosé Brut N/V. Another delightful Crémant by Berthet-Bondet. A rosé brut this time, composed of Pinot Noir and local red grapes Poulsard and Trousseau. As can be expected from these grape varieties and this domaine, it is a characterful yet elegant sparkler: dry and refreshing, revealing attractive fruity aromas of redcurrants and woodland strawberries, seasoned with a pinch of green herbs and a whiff of wild game. Crisp, balancing acidity drives the flavoursome finish. Good price/quality! Côtes du Jura Les Grandvaux 2015. AOC Côtes du Jura, Jura, France. It is certainly off to a promising start: rich, fruity and creamy, with light mineral notes and a citrus-bitter finish. A good food wine, which could do with just a bit more acidity. Côtes du Jura Balanoz 2015. A versatile and delicious Jura Chardonnay, carefully selected from 40-year old vines in the lieu-dit Balanoz, matured for a year in oak casks with lees stirring for additional aromas, structure, mouthfeel and overall stability of the wine. The barrels were topped up (‘ouillé’) in order to make a classic, non-oxidative wine, resulting in an exciting food partner with an interesting tension between citrus & orchard fruit, a fresh but full-bodied, creamy style, subtle oak spices & a nudge of grapefruit bitter. Côtes du Jura Savagnier 2014. Another organic Jura white for lovers of more peculiar wines. The last of the non-oxidative ‘naturé’ or ‘ouillé’ whites we tasted at Berthet-Bondet, this one is a 100% Savagnin Blanc (= Traminer, not Sauvignon Blanc), born on the monopole lieu-dit Savagnier and bred for a year in stainless steel. Yet this is a different style than the ‘ouillé’ Chardonnays, with more minerality & salinity and a zestier, earthier kind of fruit expression. This will keep for 5+ years and pair beautifully with crab, lobster, other seafood or cheeses. Côtes du Jura Tradition 2012. Amazing wines at a great price – what’s not to love? Here Chardonnay and local superstar Savagnin meet, after separate vinification ‘sous voile’ (under a veil of yeast) for 2 years. And what a fascinating, spicy affair it is: classic notes of oxidised apple, nuts and figs intertwine with heady curry spices, leading to a lovely lift of salinity on the mid-palate and a long, memorable finish. An intriguing, fresh, round and balanced wine, a perfect match with cheeses, seafood or poultry in cream sauces. Great value overall. Côtes du Jura Savagnin 2011. One of my favourite wines of Domaine Berthet-Bondet, and an extra half point because this 2011 vintage is so atypical and abundant, it brought smiles of wonder and intrigue (read: a goofy grin) to my face. A varietal Savagnin (=Traminer), which spent 3 years ‘sous voile’, under the protective, aroma-and-flavour-imparting veil of yeast that’s typical of the Jura’s oxidative winemaking style. This vintage shows surprisingly fruity and floral: spicy exotic fruit, almond blossom, almonds and cashew nuts. Round yet refined, and above all: delicious! Cuvée du Trentenaire “Criadera” 1985-2015. A truly unique wine! In 2015, to celebrate the domaine’s 30 years existence, Berthet-Bondet made a vertical assemblage of the 27 vintages they produced of their ‘Tradition’ Chardonnay/Savagnin blend during that period. They called it ‘Criadera’, after the barrel layers in a solera system for the production of sherry. And like good sherry – and Jura whites – this is an immensely complex wine, with an endless finish and a beautiful tension between honeyed aromas and the dry, salty, nutty, curry-spiced palate. We ended our wonderful tour and tasting at Berthet-Bondet with an AOC Château-Chalon, the denomination only for Vin Jaune, made from 100% Savagnin. After more than 6 years in casks that are never topped up, under a veil of yeast that imparts its unique characteristics, the finished wine is virtually indestructible. I love vin jaune, and this one is of particularly good quality: intense, salty, nutty and complex, with an endless finish and a beautiful balance of freshness, roundness and ever-changing flavours.